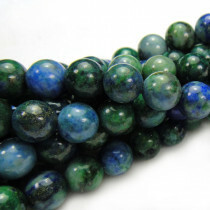 Chrysocolla is a minor ore of copper due to its blue-green colour it is sometimes confused with turquoise. The name comes from the Greek chrysos, "gold", and kolla, "glue". 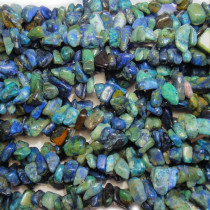 Chrysocolla can be found in Israel, Congo, Chile, Cornwall and the United States. 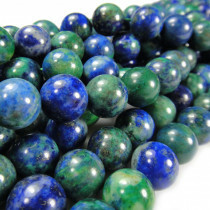 Chrysocolla Round 4mm Gemstone Beads (100pce Strand) - 40cm /16'" Strand. 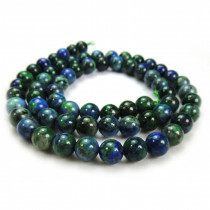 Chrysocolla Round 6mm Gemstone Beads (~66pce Strand) - 40cm/16'" Strand. 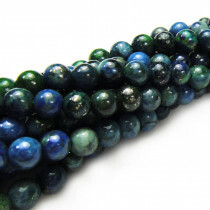 Chrysocolla Round 8mm Gemstone Beads (50pce Strand) - 40cm/16'" Strand. 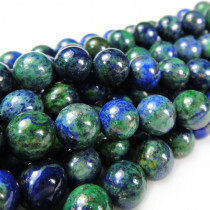 Chrysocolla Round 10mm Gemstone Beads (~40pce Strand) - 40cm/16'" Strand. 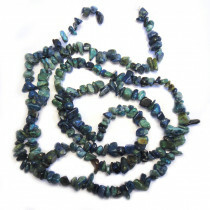 Chrysocolla Gemstone Chip Beads 5x8mm (~160pce Strand) - 91cm /36'" Strand.